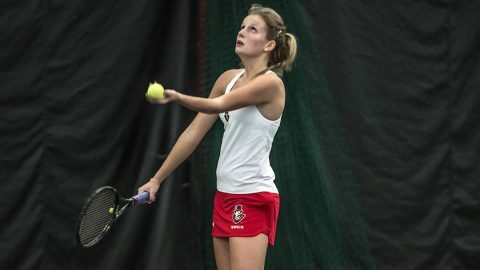 Little Rock, AR – Austin Peay State University women’s tennis team could not overcome the loss of two matches by forfeit, narrowly losing 4-3 to Central Arkansas, Sunday, at the Burns Park Tennis Center. The Govs (1-3) stayed competitive in the match despite having to forfeit the No. 6 singles and No. 3 doubles once again due to only five players being healthy. Lidia Yanes Garcia and Fabienne Schmidt won their match at No. 1 doubles, remaining unbeaten since Lidia’s sister and doubles partner Claudia Yanes Garcia went down with an injury. The Sugar Bears (4-2) won at No. 2 doubles and No. 3 doubles (by forfeit) to claim the doubles point. The Govs got wins from Lidia Yanes Garcia, Fabienne Schmidt, and Helena Kuppig from No. 1 to No. 3 singles, respectively, to take the lead 3-2 in the match, but the Sugar Bears got crucial wins at #4 and #5 singles to clinch the match. Austin Peay returns to action this Friday, February 16th at Dayton.